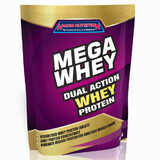 Keep your body and growth in overdrive 24/7 with Amino Nutrition Mega Whey Dual-Action Whey Protein. Mega Whey contains generous doses of both Hydrolysed Whey Protein Isolate (WPI) and Whey Protein Concentrate (WPC), the formulation scientifically designed for the athlete requiring a constant source of protein in their diet throughout the day and night. The moderate-release protein hands the digestive system the perfect opportunity to process all the protein ingested, meaning less wastage and maximum growth and recovery opportunity. This formulation also optimises recovery and growth response with a steady stream of Hydrolysed Whey Protein. An ideal supplementation choice for the busy athlete unable to feed their body with protein continuously throughout the day. I mix this sweetened Mega Whey with 1kg RAW - sugar free Caesin protein, which makes it perfect sweetness. I use 2 tablespoons protein per day with 1 tablespoon (Milo - Vitamin B Complex) in a glass of light milk. Take twice per day to get your daily requirement of aminos and increase the intake and uptake of my vitamin B Complex that increases the metabolism and balances the hormones which is always an issue later in life. Really happy with this product. Tastes great (chocolate) mixes easily, fast delivery and best price. Very pleased!